Building a deck onto your home is an excellent way to spend more time outdoors. With a deck, you’re able to host holiday cookouts, entertain guests in the springtime, or simply relax outside after a stressful day of work. While you’ll probably need to hire a reputable contractor in your area to help you with the actual construction of the deck, the ideas below can help you with designing and planning the perfect deck for your home. Built-in furniture is a great way to add functionality to your deck while still keeping in mind the aesthetics of the design. Consider, for example, built-in benches made of the decking material itself. Planters and pergolas are other options for built-in furniture. These features increase the usability of your deck without cluttering it with furniture or accessories. If you’ll be building a deck that extends from the upper level of your home, then it’s important for you to consider a water drainage system. Otherwise, the ground-level space underneath your deck could become unusable during wet weather. With a water drainage system, this space can be used for storage, as a play area for children, or as even a second, patio-style deck. Installing unique railings is a simple yet effective way to make a design statement with your deck. Most homeowners opt for the classic vinyl railing, and while this is certainly an option, it does little to help your deck design stand out. For a more unique look, consider metal railings. Metal railings can have a wrought iron design for a classic look, or for a modern spin, consider a lighter, more minimalistic design. Glass railings like these are also an option. If you plan on spending a lot of time outside on your deck, you might want to consider building screened walls around the structure. 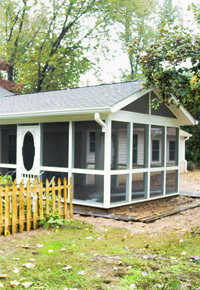 These screens can encompass your deck in its entirety, or you can portion off a smaller area of your deck, gazebo-style. Screens enable you to enjoy your deck in privacy and with added protection from insects and the elements. 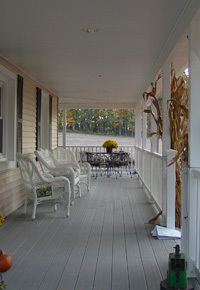 Building a deck can add a whole new element to the enjoyment you get from your home. Decks are a great way to spend time outside with family and friends, and with the ideas above, you can start designing the perfect deck for your home and lifestyle. I love those glass railings. They look so good! Not to mention the whole design is super unique. But these are great tips in general. Thank you for posting such a great read!